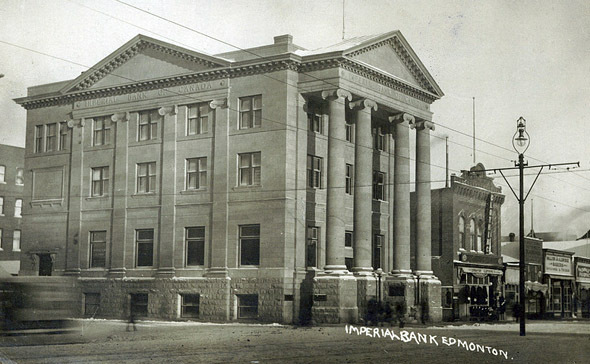 During the late 19th century, the Imperial Bank of Canada was expanding across Canada, opening a branch in Edmonton in 1891. An all-new building was constructed on the site in 1907, a grand Classical Revival sandstone structure which cost $90,000. Its entrance portico was supported by giant columns three storeys tall, elevated on one-storey-high plinths. The main hall was tiled with white marble mosaic, with a border of coloured marble. A special room was designed for women customers. During the economic boom of the late 1940s and early 1950s, the financial needs of clients grew exponentially, and this bank building at this location was demolished in order to construct a larger and more modern building. 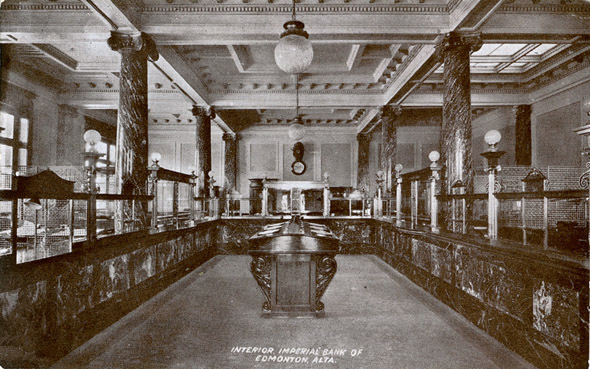 In 1960 the Imperial Bank merged with the Canadian Bank of Commerce and continued to operate from this location until 2000.